TeamViewer throttled at same time as P2P? I support a few work systems from home out of hours, using TeamViewer. For about the last two weeks, TeamViewer connections from home have been running so slowly that they are unusable, but only between the hours of 4pm and Midnight. It's so precise, I can see the degredation start spot on 4pm, and then at exactly midnight it all goes back to normal. This seems to coincide 100% with the timing of BT's throttling of peer-to-peer connections. I've asked BT, but all the help I got was "No, we don't throttle your connection as you have BT Infinity Option 2". They didn't know what TeamViewer is, although I suppose they don't have to know every piece of software I might be likely to run. TeamViewer say that they only use Port 80 - that's not a P2P port is it? Have had to resort to using it over 3G from my mobile phone between these hours, which is less than ideal. Everything else is absolutely fine - browsing, downloading, speed tests the lot - all just as they should be. I don't use P2P so I have no idea if that is slow, but does anyone have any ideas? Re: TeamViewer throttled at same time as P2P? I have been using Teamviewer in a minor way across my 3 "PCs" at home; and had tested its use from another location about one mile away. I don't normally take my netbook on trips; but I did so on Monday, 19th March, to test WiFi facilities at airports and the hotel.some 400 miles away in Hampshire. So I happened to try Teamviewer around 18:30 and 21:15 that evening, using the hotel WiFi for the local connection. The connections on each occasion responded quickly, with an almost imperceptible delay, that I would not complain about. TBB Speedtest from home is generally in the range 3 to 6.3 Mbps over the Netbook WiFi, correspondingly being about 3.2 Mbps at the hotel. I certainly did not have any difficulties with Teamviewer in those circumstances - and have also found it more useful at home than expected. The hotel had at least 4 WiFi circuits; but two were centred on the same Channel, 11, which suggests that there may be a degree of conflict there. However, I was very disappointed with the WiFi at the two airports, Edinburgh and Heathrow T5, being unable to get functional connections at either, from the many WiFi circuits showing up - inSSIDer..
That set me wondering how many of the airport PC users are making use of the airport WiFi; or are the majority simply not connecting or using dongles? A colleague who has more extensive experience commented that he had similar experiences. It can be bit lot more complicated than that. If TeamViewer isn't using the HTTP protocol (and it is unlikely it as this protocol is not optimal for that sort of thing) then simple packet inspection will see the difference, and another protocol "hiding" on HTTP's usual channel (especially if that protocol is encrypted) it may look to the traffic shaping heuristics like P2P traffic trying to hide. Of course something like that may use UDP rather than TCP, which will make the protocol(s) even more easily distinguishable from HTTP, and if it uses NAT punching techniques like STUN to make direct UDP "connections" from host to host without intervening servers then it is P2P and has a high chance of being identified as such. Also it is worth considering the ISP at the other end. They might be throttling as well as or (instead of) BT having an effect. Ok, it's not the other end - that's on a dedicated 100meg leased line. Also, as I said, I can use my 3G connection to make TeamViewer connections - they don't suffer from the slowdown at these times, it's just a royal pain trying to do it on a 3.5" screen instead of from the PC. 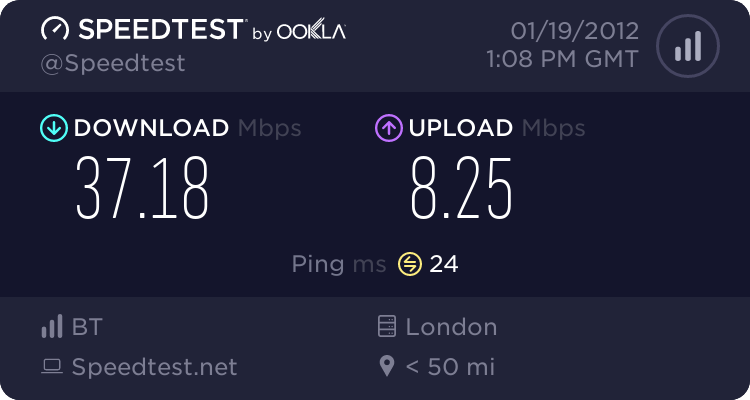 Other people I work with, one on Be and another on Sky broadband, don't suffer with connection problems between 4pm and 12am, just me - so I have to assume it's my end, and as my connection is otherwise totally fine at these times, it can only be BT throttling the connection and assuming it is P2P traffic. Can you link your 3G device to your PC in some way? That would definitely imply it is likely that it is getting trapped in traffic shaping at your ISP. probably because it is getting mistaken for bulk P2P traffic. If you have a VPN arrangement that does not get similarly throttled, could you try route the protocol over that? Not an ideal solution but it might be a useful workaround until the problem is resolved. Also, if the application supports different protocol transports (I've never used it so I don't know, but some software of that type offer a selection of transports and encodings) try forcing it to use particular ones to see if the default is getting caught up in the shaper be the others don't. Most 3G devices can have a machine tethered to them in some way, but it might not be a practical solution depending on the tariff he is currently on. Unless the tariff includes "unlimited" data a large bill could result (and if it does include unlimited data, you could still hit some ill defined FUP). And unless things have changed since I last looked, many mobile phone internet connections forbid tethering. All the new o2 contracts include tethering. I believe quite a few include this now. They just put data limits in place to avoid abuse.